You are here: Home / Freebies / CVS: FREE Cold Buster Honey Lemon Cough Syrup! 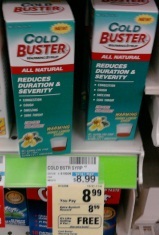 CVS: FREE Cold Buster Honey Lemon Cough Syrup! There is an unadvertised deal on Cold Buster Honey Lemon Syrup at CVS this week. Since this is an unadvertised deal, you may need to use the price scanner to verify that it is available at your store. Thanks for the photo and the great deal, This Frugal Life! Check out the rest of the deals at CVS this week.